Here’s a potential gotcha I’ve seen popping up with some frequency online lately. When Microsoft releases a new Windows version, a new version of Media Creation Tool come out, too. Alas, the MCT is always named MediaCreationTool.exe. That filename can’t tell what version of Windows 10 MCT supports unless you do some poking around. But whatever MCT version you’ve got, it will always and only download the Windows version to which it’s tied. In the simplest terms, an old MCT grabs an old version of Windows. That’s not always what you want, so it’s smart to check the MCT version before you use it to download and install Win10. There at least two ways to tell which version of the MCT you’ve got. The quick, dirty and less reliable way is to open File Explorer and look at the file date. If it’s older than the current version of Windows 10 (or the version you want), don’t use it. Jump to the Download Windows 10 page, where you’ll click the “Download tool now” button to grab the latest and greatest MCT instead. 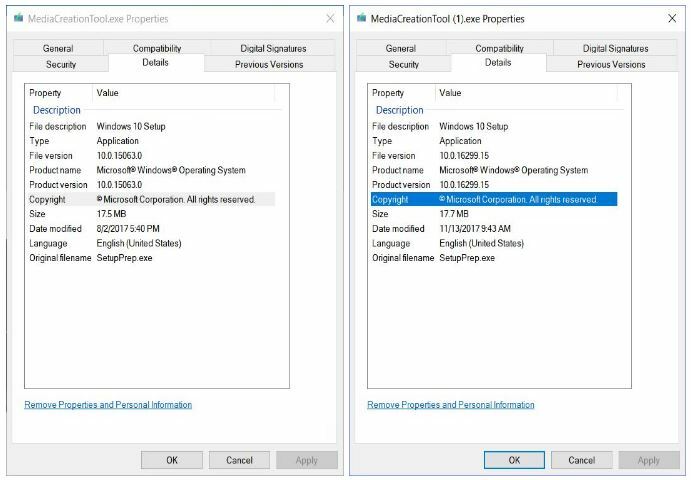 Spring Creators Update (1703/15063) left, Fall Creators Update (1709/16299) right. Of course, identifying what’s what requires having a clue about Windows version and build numbers. You can get those basics from Microsoft’s Windows 10 release info page. In fact, that page tells us what we need to know about the two foregoing MCT versions shown. The current version of Windows 10 is 1709 and is build 16299; the previous version is 1703 and is build 15063. That’s how we know the MCT on the right is the most current version and the one to its left its predecessor. And of course, the file dates tell the same story, too. Using MCT for Older Win10 Versions … NOT!